This panel probably was intended for a curtain tie, used to hold back the curtains of a poster bed when decorated for the Straits Chinese wedding festivities. 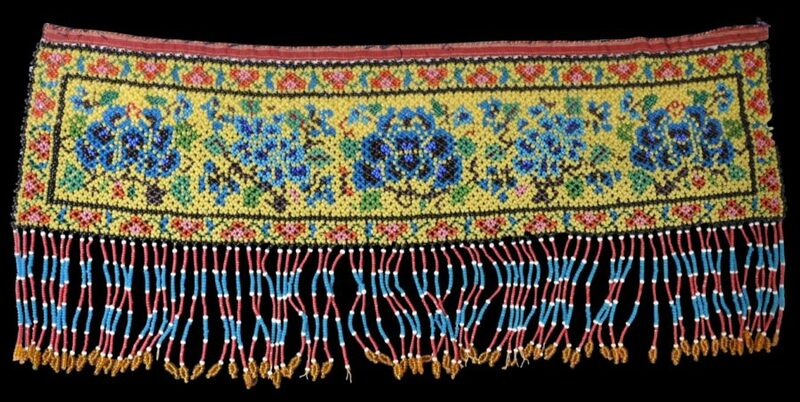 It is of rocaille beads that have been knotted together in such a way that the panel can be viewed from either side. Beaded tassels are suspended from the panel. The panel is decorated with an auspicious blue peony against a bright yellow ground. A similar panel is illustrated in Cheah (2010, p. 119). That panel is attributed to a Penang lady of Hadrami origins, Siti Rahmah binte Haji Yahya. It is thought that she might have learned such beadwork from her Straits Chinese neighbours and possibly undertook such work for Straits Chinese clients. The panel is in fine condition other than a nibble to one side from which some beads have been lost.